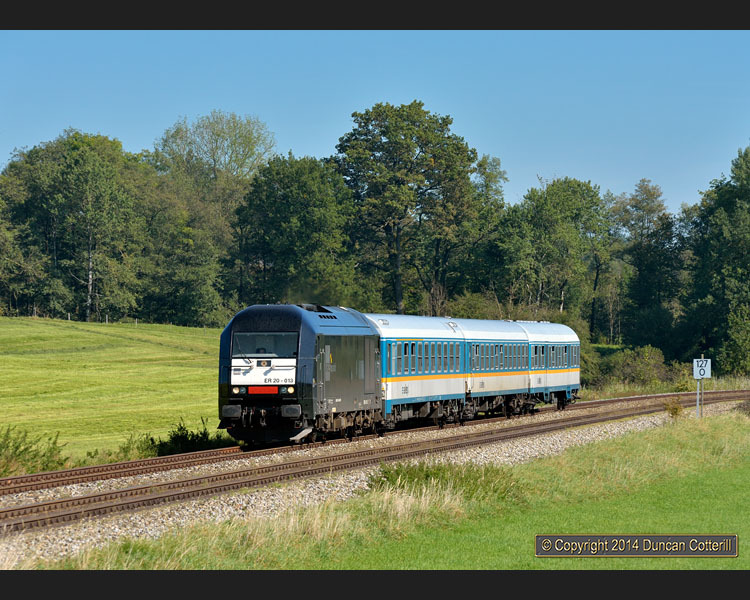 Dispolok 223.013 approached Wohmbrechts, east of Hergatz with ALX84146, bound for Lindau, on 29 September 2014. The loco was a long way from where I'd last seen it, working along the North Sea coast on the Marschbahn in July. ALEX 223.069 was running without the yellow and white bodystripes normally seen on ALEX locos when it approached Altstädten with northbound ALX84173 from Oberstdorf to München on 29 September 2014. It was late on the third day before I got my first freight in sun but it was a close run thing. Five minutes later the spot would have been in shadow. 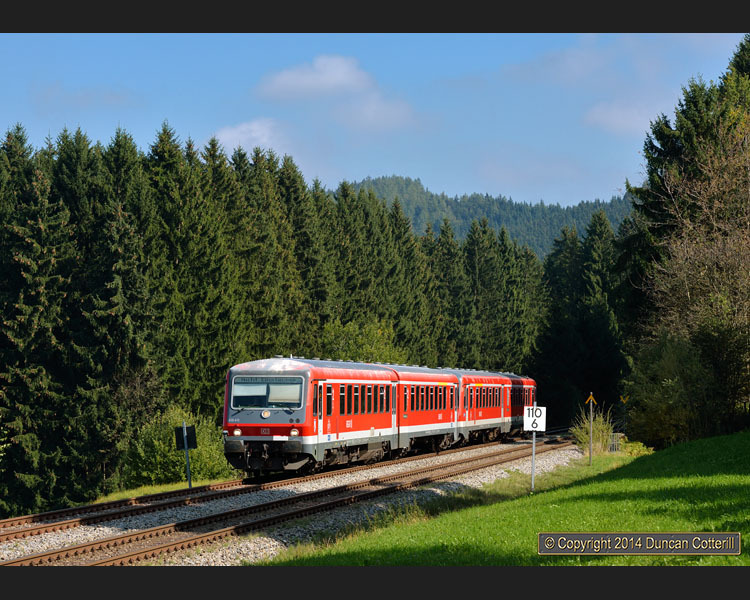 233.285 coasted through the valley of the Obere Argen near Weissenbachmühle, north of Oberstaufen, with westbound EZ45194 on 1 October 2014. 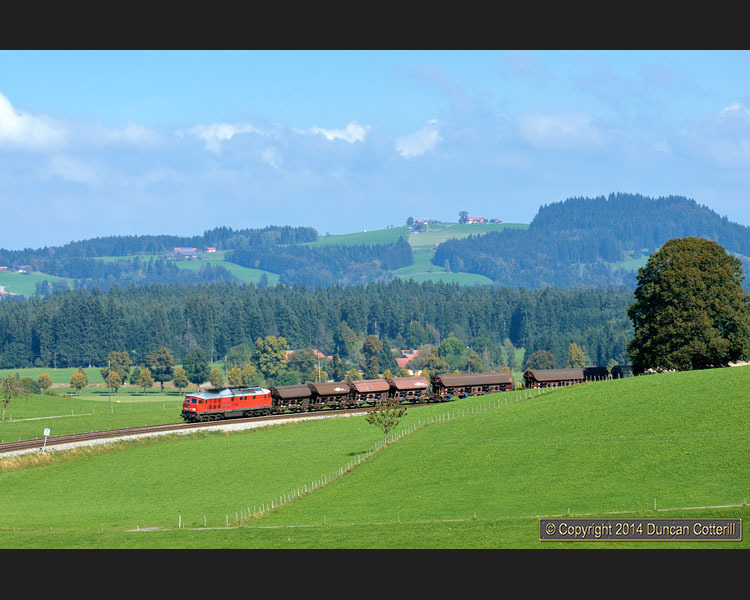 The morning fog hadn't completely dispersed when 233.219 passed Riedhirsch, west of Röthenbach, with eastbound freight EZ45191 at 09:26 on 2 October 2013. 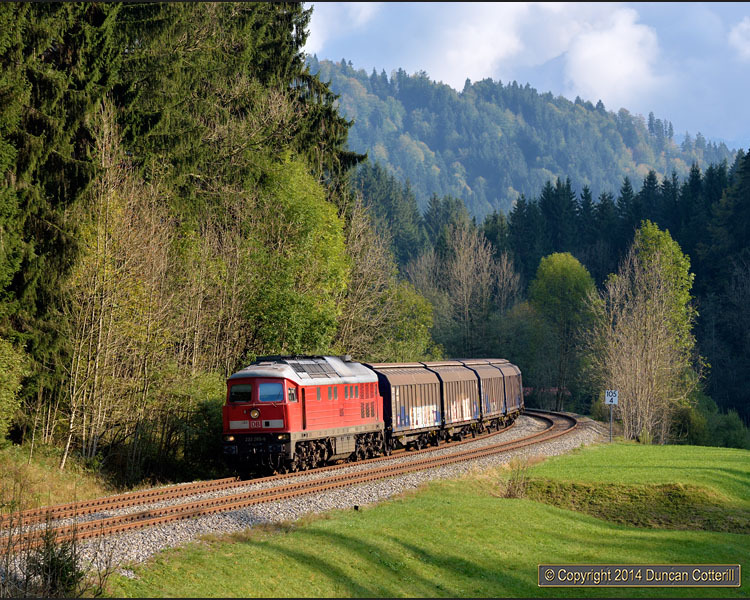 233.285 led westbound freight EZ45190, a through working from Wien ZVbf in Austria to Buchs SG in Switzerland, past Heimhofen, east of Röthenbach, on 2 October 2014. 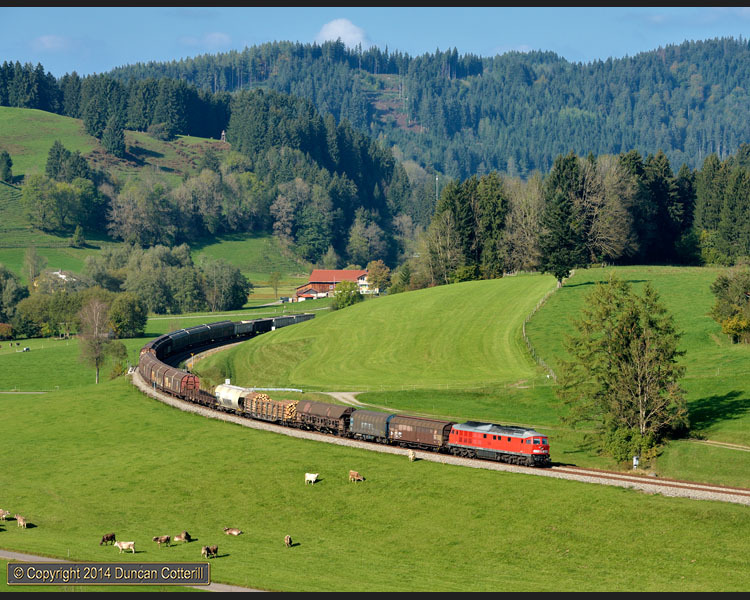 Another shot of 233.285 winding through the green hills of the Allgäu at Heimhofen with EZ45190 on 2 October 2014. 628.419 and 628.431 emerged from the woods near Heimhofen with RB57606, the 13:07 from Kempten to Röthenbach, on 2 October 2014 and made a nice change from the 612s that work most regional services on the line. On Monday, Wednesday and Thursday afternoon I'd climbed this hill in sunshine, only for a cloud to arrive just as EZ45193 came round the bend and ruin the shot. On Tuesday it had been raining, in case you were wondering, and I hadn't bothered. Finally, on the Friday afternoon, the sun stayed out, making all the effort worthwhile. 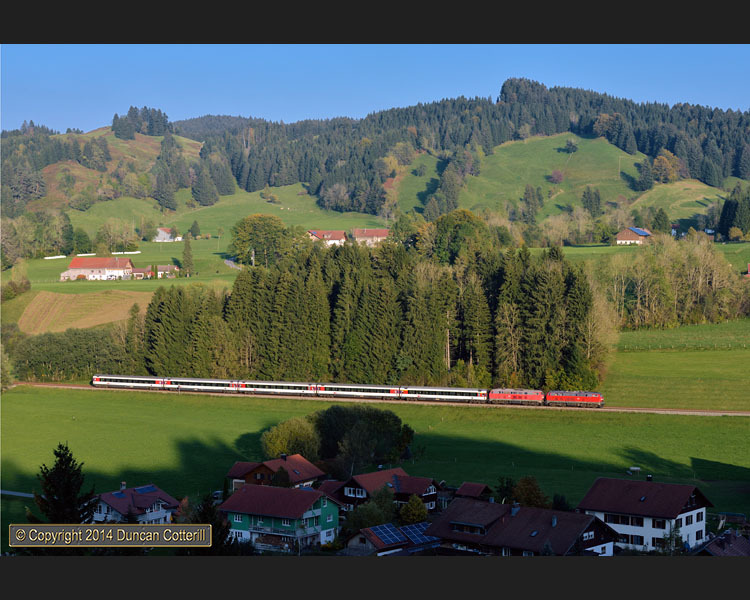 233.373 passed Oberthalhofen, north of Oberstaufen, with the Buchs SG to Hallein freight on 3 October 2014. 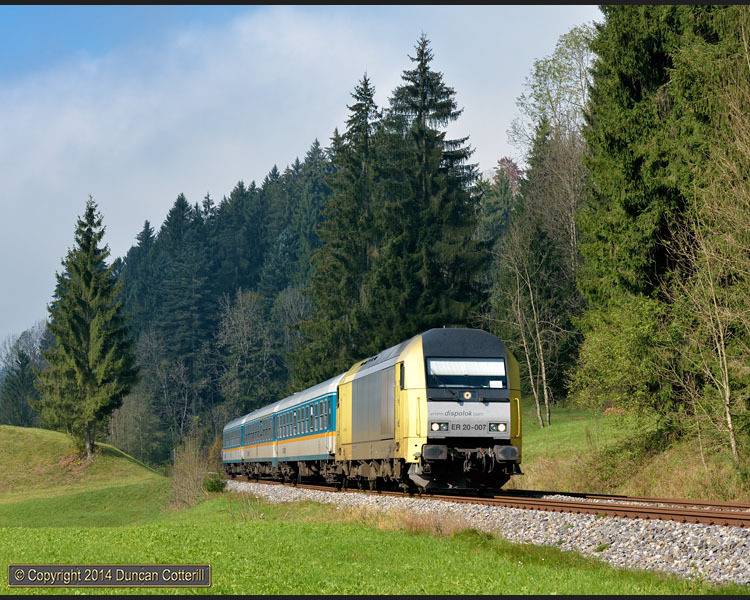 Westbound EZ45194 was running late on 3 October 2014 and had missed its path from Immenstadt. With the shadows advancing and an ALEX due it looked unlikely that the freight would arrive at Oberthalhofen before the light went. Fortunately the ALEX must also have been delayed and the freight came in its path with 233.322 on the front. A wider view of 233.322 passing Oberthalhofen with westbound EZ45194, the afternoon Hallein to Bludenz freight, on 3 October 2014. 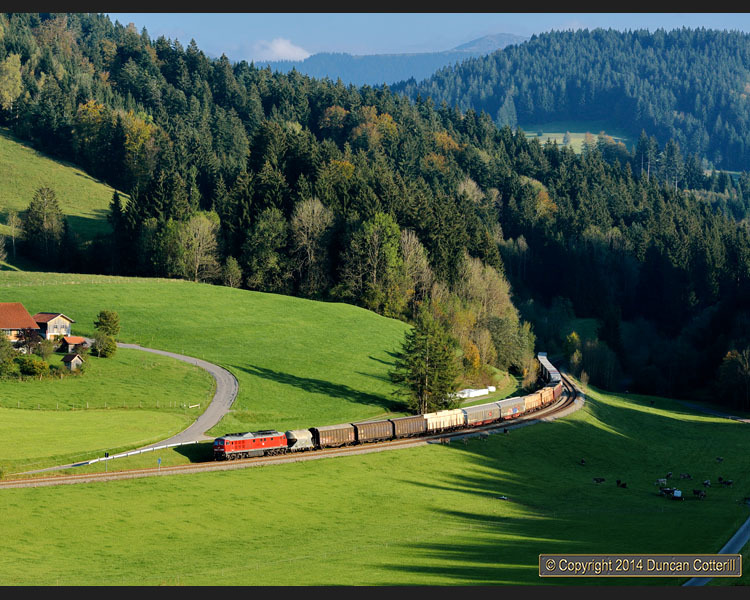 There can't be many more attractive places to photograph trains than the glorious Allgäu landscape. Ulm's 218.494 and 218.343 caught the last of the light as they passed Oberthalhofen with EC1291, the Fridays only 15:16 from Zürich HB to München Hbf, on 3 October 2014. 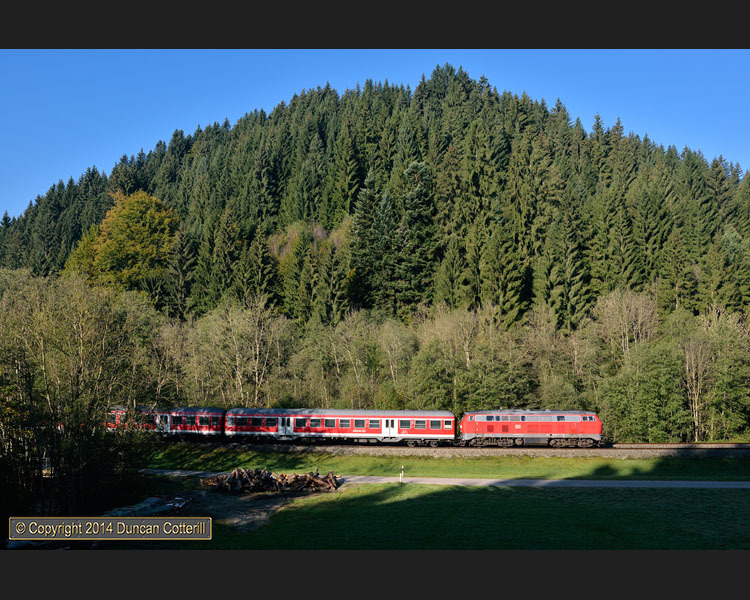 218.457 worked RE57392, the weekends only 07:42 München Hbf to Lindau Hbf cyclist's train, into the narrow valley of the Obere Argen at Weissenbachmühle, north of Oberstaufen, on 4 October 2014. The first morning eastbound, EZ45191, ran about two hours late on the morning of Saturday 4 October 2014, allowing time for the shadows to clear at Weissenbachmühle, north of Oberstaufen. It was the only eastbound freight that did run that day. A two-week closure of the Arlbergbahn, the only rail link between the Vorarlberg region of western Austria and the rest of the country, necessitated bus substitutions for most passengers and long diversions through German territory for freight and overnight passenger trains. Most of the diverted trains ran via the Allgäubahn between München and Lindau, providing a rare opportunity to photograph long loco hauled trains on one of Germany's most scenic diesel worked routes. I visited the line from Monday 29 September to Saturday 4 October 2014. The Allgäubahn has long been a favourite of mine. The line runs for 221 km from München to Lindau on the shores of the Bodensee via Buchloe, Kempten and Immenstadt. En-route it passes through a variety of attractive scenery and runs through the Alpine foothills between Immenstadt and Röthenbach. See my earlier reports for more details of the route. These are shared between DB Regio, DB Fernverkehr and ALEX. Although the basic service pattern has hardly changed since my last visit in June 2013, there has been a further reduction in the number of trains worked by DB Regio class 218 diesels. The classic combination of red 218 on red push-pull stock is now largely restricted to the München – Füssen and München – Memmingen routes, with no workings west of Kempten apart from the summer Saturdays, Sundays and holidays bike train to Lindau. Between Kempten and Biessenhofen, junction of the line to Füssen, 218s now only work a couple of trains a day in the peak hours. The bike train, RE57392, was seen twice. On the Friday, a holiday, 218.469 had a seemingly dead 218.486 and train in tow and was running an hour late when seen east of Kempten. Others saw it later, west of Kempten, with a single loco and 75 minutes down. The following day 218.457 was in charge and the train was late again, delayed by problems with the preceding EC. Most other DB Regio services are worked by class 612 DMUs. A pair of class 628 DMUs added some welcome variety on weekdays, working from Kempten to Röthenbach as RB57606, returning to Immenstadt ECS then covering RB57674 to Oberstdorf. A class 642 was also seen stabled at Oberstdorf on one occasion, the first of this type I've seen in the area for a few years. EuroCity services between Zürich and München continue to run east of Lindau with pairs of Mühldorf based class 218s but only one of the four daily trains in each direction runs via Kempten. The other three take the faster but less scenic route via Memmingen. The morning westbound, IC196, produced 218.401, 418, 419, 423, 433 and 454 on various occasions, always double headed except once. On that occasion, 423 handled the train on its own and was 30 minutes down at Oberstaufen, presumably having dumped a failed partner somewhere en-route. An additional pair of weekend EuroCity workings that used to run intermittently have become regular this year, running to München on Friday afternoons and returning to Zürich on Sunday afternoons. These trains do run via Kempten and the Friday train, IC1291, was seen on 3 October, worked by a pair of Ulm 218s, 218.494 and 218.343. 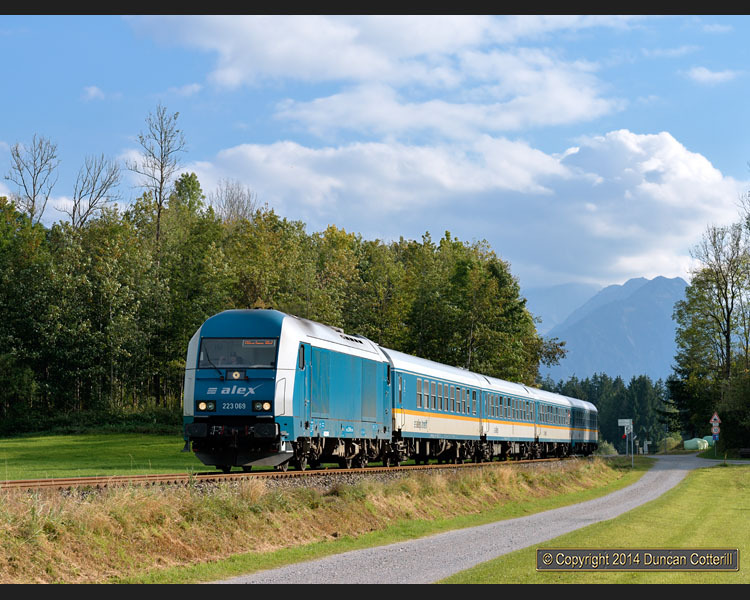 InterCity services between Oberstdorf and northern Germany also continue as before with two trains leaving Oberstdorf every morning and returning during the afternoon and early evening. These services should still be hauled to Stuttgart and Augsburg respectively by Ulm based 218s, with double heading between Immenstadt and Stuttgart for IC2012 and IC2013. None of these trains was actually seen - I just wasn't in the right place at the right time. ALEX continue to operate the 2-hourly fast trains between München and Immenstadt, where they divide, with one portion continuing to Lindau and the other to Oberstdorf. There seemed to be more two-coach ALEX trains west of Immenstadt than in recent years but there were also a handful of four coach workings and these weren’t on services that might be expected to be very busy either. The same four locos worked the Lindau trains all week ALEX's own 223.062 and 223.063 and hired Dispoloks 223.007 (in the original yellow and silver) and 223.013 (in black). The last time I saw 013 was on the Marschbahn in July. The Oberstdorf shuttles were seen only once, worked by ALEX's 223.069 in a variation to the usual livery without the yellow and white side stripes. With two Dispoloks on hire there no longer seems to be a need to bring in 2143s or infra liveried 218s to work the Oberstdorf branch. Freight traffic on the Allgäubahn is usually very sparse east of Kempten and non-existent further west. The only regular working is a Mondays to Fridays pick-up goods from Buchloe to Kempten and back, worked by a class 294. I was never in the right place to see if this ran. For the period of the diversions, one freight in each direction was scheduled to run via Memmingen with four eastbounds and five westbounds taking the Allgäubahn via Kempten, not all in daylight though. A normal weekday at the west end of the line would see a train each way in the early morning, a train each way late morning/lunchtime and a train each way mid/late afternoon. There were very few cancellations and most trains ran fairly close to right time on most days. There were some delays of up to two hours and one or two trains that ran up to 30 minutes early. The Allgäubahn west of Immenstadt can be fairly busy and the sections are up to 16km long, meaning that a gap of over 30 minutes is required to accommodate an additional train without delaying the following service. If a freight missed its path, it could sometimes be well over an hour before there was another slot. As usual, there were fewer trains on weekends and Mondays but as Friday 3 October was only a holiday in Germany, not in Austria or Switzerland, freights ran as normal. Saturday 4 October was very quiet with one eastbound not running at all and another running light engine. In previous years the normal power for most freights was a pair of DB 232s. The Memmingen route can't take the weight of 232s and pairs of 225s worked the few trains that were routed that way. It was unusual to see 225s on the Kempten line but they did appear on the odd train, presumably to balance out workings. This year was different in two main respects, firstly the use of single ÖBB class 2016 diesels on the Memmingen trains and one early morning working via Kempten and secondly the use of single 233s on the other Kempten trains. Ulm based 232.703 was seen but it only appeared to make a couple of trips on one day. Other trains were hauled by 233.219, 285, 322 and 373. With the demise of the class 225s, DBS would have struggled to find any suitable locos from their own fleet to work trains routed via Memmingen so the 2016s were a logical choice. Locos 2016.026 and 2016.079 were seen. Since I left, a DBS class 247 (class 66) has been reported on at least one freight - hopefully it won't be back. The diesels worked freights between München-Laim or München Ost and Lindau-Reutin with ÖBB electrics handling them either side of that. The overnight passenger trains seemed to use either route, probably depending on how late they were and where pathing problems were anticipated. EN246, the Wien to Feldkirch (normally Bregenz) train was seen twice, on each occasion hauled by a pair of Ulm 218s. 218.343, 487 and 494 were all noted. On one occasion the train came off the Memmingen line at Hergatz and on the other it was seen on the Kempten line near Röthenbach. EN414/464 was reported to have been hauled by a pair of ÖBB 2016s during the week of my visit, so not everything was 218 worked. EN466 and the three eastbound trains ran all the way in darkness and weren’t seen. I attempted to use ÖBB’s Zugradar to track down the position of the sleepers before leaving the hotel each morning but it proved very unreliable with both EN246 and EN414/464 disappearing completely on most mornings. On the morning I saw EN246 near Röthenbach, it had covered the 180+ km from München Ost in a record breaking 70 minutes, according to Zugradar. The Allgäubahn is an excellent place to photograph trains with so many twists and turns that there’s always somewhere that’s right for the light. The scenery is superb with plenty of hills and valleys, picturesque villages, farms and forests, not to mention the odd lake or mountain. Local farming practice, which involves growing grass for cattle feed and cutting it several times a year, right up to the trackside, keeps the lineside vegetation under control, so clear locations are more common than on most lines. 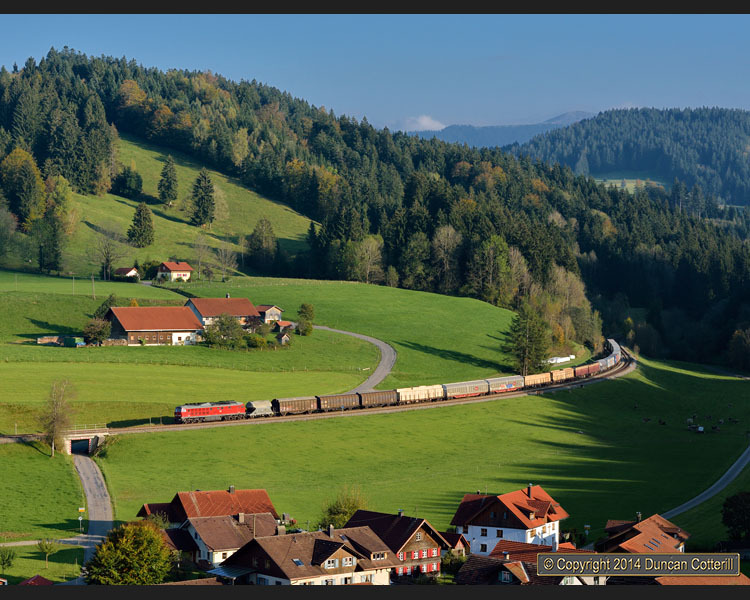 All that’s missing on the most scenic section, west of Immenstadt, is the long trains that suit big scenic locations. There’s a limit to what you can do with the single daylight EC train. East of Immenstadt the scenery is gentler and longer trains aren’t difficult to find with the combined ALEX workings often running to six or seven coaches and two ICs each way a day. There’s even the occasional freight east of Kempten. With that in mind, I spent almost the whole trip west of Immenstadt with only one brief visit to the Oberstdorf branch and another to the main line north of Kempten. The line west of Immenstadt has far too many good locations to detail here but it’s worth mentioning that most of the spots I used were between Oberstaufen and Röthenbach and most were too far from either station to be sensibly reached on foot. Staying on the western section of the line did make life more difficult as most of the regular passengers passed when I was waiting for a freight at a location that suited a longer train. I watched a lot of 2 or 3 coach ALEXs and 2 car DMUs go past without getting many good shots but it was the only way to be sure of being in the right place when a freight did arrive. It wasn’t a particularly productive trip in some respects, with relatively few freights each day, morning fog that often lingered into the afternoon and clouds that seemed to appear from nowhere whenever a freight was due. More than 30 freights were scheduled to run in daylight while I was there but I only got good shots of six. No sleepers were successfully photographed and only one EC, one 218 hauled RE and a handful of ALEX’s and DMUs. When the sun did shine it was worth all the hard work, as I hope the pictures at the top show. It was Oktoberfest time in München with expensive airfares to suit, so I ended up flying to Zürich and hiring a car from there instead. Zürich’s actually closer to Lindau than München so it wasn’t as inconvenient as it might sound. Flights from and to Heathrow were with Swiss. The car was hired from Dollar, to be collected from Thrifty, which turned out to be Hertz. As car’s go it was one of the worst I’ve ever driven but it got me where I wanted to go. Accomodation was at the Landhotel Bauer in Sonthofen. If your photographic interests tend towards quality rather than quantity, a visit to the Allgäubahn during diversions should be a high priority. Most years see either diverted freights when the Arlberg is closed or diverted ECs when there’s a closure on the Buchloe – Memmingen – Lindau route. Even when there aren’t diversions, there’s plenty to photograph, particularly east of Immenstadt where the ALEX’s are longer and there are ICs as well. West of Immenstadt there are plenty of spots that suit the short ALEX trains but they're not the places shown here. Occasionally there are closures of the Oberstdorf branch and the longer ALEX trains continue to Lindau without splitting. For 218s on classic red Regio coaches, the Füssen line isn’t far away but you’ll need to be quick as they’re unlikely to survive the December 2014 timetable change. The news for ALEX is rather better. It was announced in August that the ALEX franchise will continue much as it is until 2020, by which time the Buchloe – Memmingen – Lindau route should be electrified and services are due to be recast. DB will take over from ALEX with new tilting trains, almost certainly units of some description, possibly bi-mode diesel/electric.